Entries are open for the 2019 Simplyhealth Great South Run, which will take place on Sunday 20 October. It was a weekend to remember for Portsmouth as the South coast played host to over 20,000 runners for the Simplyhealth Great South Run. Now in its 29th year, the world's leading 10 mile running event featured a strong British elite field with Chris Thompson and Eilish McColgan taking the 2018 titles. Thompson made it three wins in a row, crossing the finish line in 46:56, a first for the event. His Aldershot Farnham & District AC teammate Andy Vernon came second in a time of 47:29 and Petros Surafel came third in 48:05. Eilish McColgan won the women's field in 54:43, her debut over the 10-mile distance. The daughter of two-time winner and Scottish running legend Liz, followed in her mum's footsteps, who last took the Great South Run crown in 1997. Steph Twell followed her across the line in second in a time of 55:16 and Gemma Steel was third in a time of 56:56. 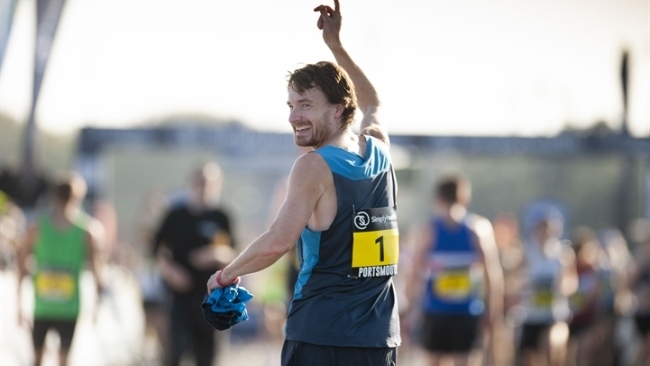 The Simplyhealth Great South Run gave participants a scenic tour of Portsmouth, with a fast and flat course that has been graced over the decades by world-class athletes such as Sir Mo Farah, Liz McColgan, Paula Radcliffe, and Sonia O'Sullivan. The event, staged in the city since 1991, offers a unique opportunity to run through Portsmouth's Historic Dockyard, passing iconic landmarks such as HMS Victory, HMS Warrior and the Mary Rose Museum. On Sunday, 20,000 participants descended on the city for the main 10-mile event, including club runners, charity fundraisers and those taking part for a personal challenge. Among them was the 17-year-old sister of murdered soldier Lee Rigby. Courtney took part in the event with a team of supporters to raise money for the Lee Rigby Foundation, which has been set up by her family to support victims of British terror attacks. Boxer Kate Farley also walked the final mile of the event on the seafront with the help of a walking frame, despite suffering from cerebral palsy. Kate completed the event to support the Superpeople charity she co-founded to show how disabled and non-disabled people can work together to create social change. The weekend of sport kicked off on Saturday 20 October with the new Simplyhealth Canine Run. In a first for the Simplyhealth Great Run Series, 100 dogs took part in a 2.5k run with their humans, starting and finishing on Clarence Esplanade. This was followed by the Simplyhealth Great South 5k where the Lord Mayor of Portsmouth, Councillor Lee Mason, joined 1,000 runners to take on the shorter running route as part of his new Small Changes, Big Difference Campaign. 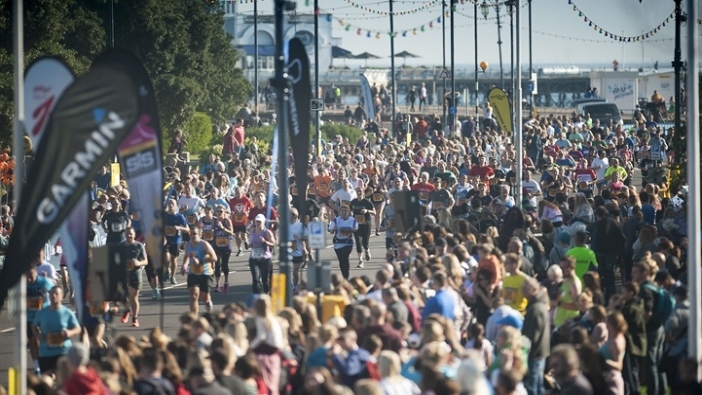 The 5k was followed by the Simplyhealth Junior and Mini Great South Run, with thousands of young runners filling the Southsea sea front with a seaside-themed fancy dress competition. 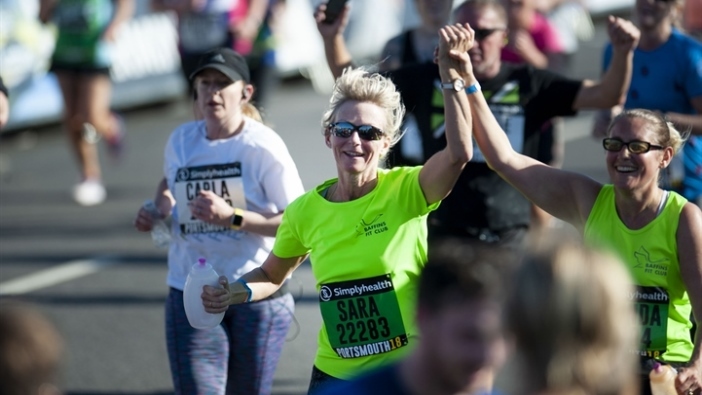 Jayne Fearn, Simplyhealth spokesperson, said: “The glorious sunshine made for great conditions for a fantastic weekend of events in Portsmouth, from the first ever Simplyhealth Canine Run to the Simplyhealth Great South Run on Sunday.